When it was announced that Roseanne would be returning to ABC via nine-episode revival, fans wondered if Johnny Galecki would make a return as David Healey, Darlene's (Sara Gilbert) longtime love, given his gig on the hit CBS comedy The Big Bang Theory. Fortunately, Galecki's return was first confirmed on Instagram, and viewers got their first look at David back in the Conner household in the most recent trailer. Ah, nothing beats a reunion, right? 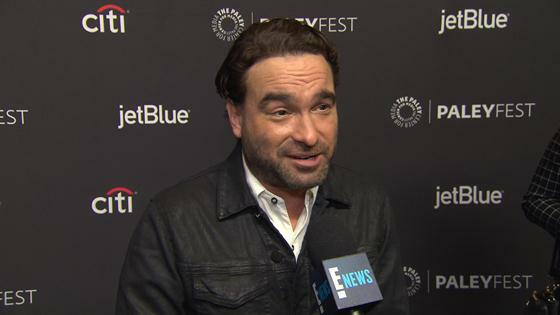 "I'm excited," Galecki told E! News at The Big Bang Theory and Young Sheldon's event at PaleyFest on Wednesday night. "I'm excited to see it. I was a big fan of the show before I had anything to do with anyone on the show, and so I'm excited." But just how much of David will fans see in the nine-episode revival? Galecki confirmed he returned for "just one" episode, but he was "thrilled to hear Sara Gilbert was able to put everyone back together again." Hey, we'll take what we can get, right?! The new season features the entire original cast—Barr, Goodman, Gilbert, Fishman, Lecy Goranson and Laurie Metcalf—back in their signature roles. Sarah Chalke, Becky No. 2 on the series, plays a new character, Andrea. New additions to the family include Emma Kenney as Darlene's daughter, Ames McNamara as Darlene's son and Jayden Rey as D.J. 's daughter. Other returning faces include Estelle Parsons, Sandra Bernhard, James Pickens Jr. and Natalie West. The Big Bang Theory airs Thursdays at 8 p.m. on CBS, while Roseanne premieres Tuesday, March 27 on ABC.